No sense burying the lede here. How's that for a spoiler? We left Mawenzi Tarn early -- around 7:20 -- and headed to Kibo Hut. First we crossed "The Saddle", a dry, sparse, lunar landscape. We were thrilled that our weather was beautiful. You can see we've dropped back. Did I mention that we're aiming for the top of THIS today??? I was already struggling with my breath -- a side effect of the altitude or the Diamox, I'm not sure. And as we climbed the last stretch to Kibo Hut -- well back from the group -- I'm pretty sure I had a minor panic attack. But we made it. There was some weirdness, however. The ranger was arguing with Erik about letting people continue up during the day. The first group had just left as we arrived. There was a little pow-wow between Erik and the guides. Given how I'd struggled just to make it to Kibo Hut, I wanted to get their input before making any decision. But I was certainly happy when they told us just to GO. We then were introduced to our guide for the summit push: Hamisi. He was the perfect guide for my condition. He took my pack right from the get-go, which was unexpected but very welcomed. And up we went. I know this doesn't look steep. I know. But, trust me, it was. I was really struggling with my breathing, but I just put my head down and kept going. I was literally just staring at Hamisi's feet, not looking up or down. I promise you, it's really steep. Really. I needed to stop pretty frequently to get water and nibbles of food. We discovered that Hamisi didn't have any water with him, so we made him take our little Nalgene so he'd have something. I'm not gonna lie, I barely remember any of this. I'm glad we had a beautiful day, though! Taking a break and smiling ... perhaps I was already delirious? Partway up the hill Hamisi pointed out that we were passing Williams Point, so of course we needed to stop and take a photo. This is the 5000m mark on the mountain. 280m down, 585m of elevation left to go. Then more slow climbing. I read somewhere that "you cannot go too slowly on Kilimanjaro". Amen, brother. Eventually we took another little break at Hans Meyer Cave (squee!). The only food I wanted, amusingly, was bits of Kendal Mint Cake given to us by Amanda and Shawn -- who had never tried it, but were sold it by someone at an outdoor shop. Shawn: "It's this weird stuff ... it was used on the first Everest climb..." Us: "KENDAL MINT CAKE?!?!?!?!" Wil reminded me not to look up, so I didn't -- I just kept watching Hamisi's feet. The hardest part was a rocky stretch called Jamaican Rocks -- some big steps, some slippery spots, and I just kept thinking that it wouldn't be very fun going down them in the dark. Okay, I think this image actually captures how steep and difficult this stretch was! At some point, Hamisi took my hand and helped me up some of the stretches. At some point, I looked back and saw a man moving very quickly up the mountain toward us. A man dressed in a singlet and compression shorts, looking for all the world like a triathlete who had lost his way. I had this crazy idea that it was the ranger running up the hill to tell us we needed to turn back. 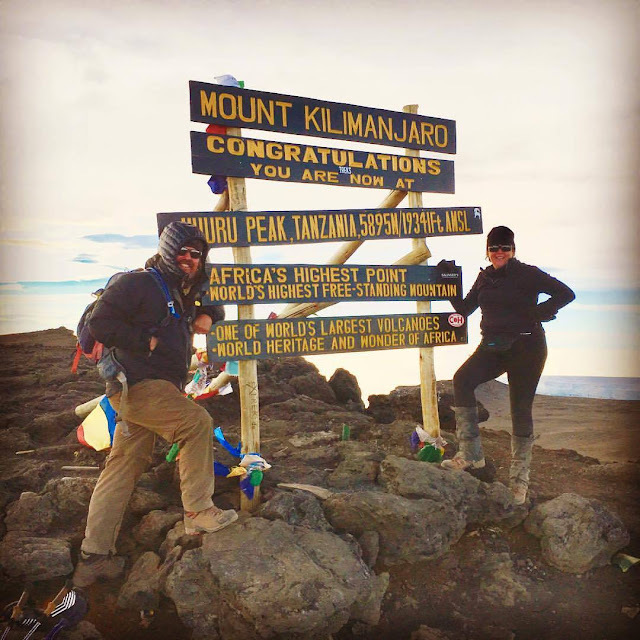 Endurance runner, Simon Mtuy, set the record for the fastest ascent and descent of Kilimanjaro unassisted, completing the trek up and down in just 9 hours and 22 minutes. He first climbed the mountain when he was 16, and has since ascended to the summit more than 300 times. He blew past us with a quick nod ... we didn't see him again for a while. Faaaaaaast. Next we met Erik and Marcie, running down the mountain. Erik said, "Hey! You guys are doing great! Marcie had some altitude issues, so we're just heading down quickly! Keep it up!" They would both tell me later that Marcie was fine until just below the summit -- they had been chatting, running, taking pictures ... when all of a sudden Erik noticed she had stopped talking. So they got some quick photos at the top and scampered back down. It felt like it took us a very long time to reach Gilman's Point, 5686m. But I look at the time we took the photos, and apparently it took us 5.5 hours to reach there from Kibo Hut, only half an hour more than we were told to expect. And, seriously, this first look into the crater made me cry. Or perhaps it was the exhaustion. And a bit of relief. I had read that getting to Gilman's is the hard part -- that the last 209m of elevation was relatively easy, that you just walk around a wide path on the crater rim to the true summit at Uhuru Peak. So I admit to being a bit surprised -- and dismayed -- when I realized that there was still a long way to go. And that there were still a lot of hills. So we didn't linger, and off we set. I was actually feeling pretty positive at this point. We saw our first "snow" ... okay, icicles. And, oh, look at that crater! I can't believe how big it is. There was a scary little "detour" along this stretch -- with red metal "fence barriers" anchored on the slope. I wouldn't have trusted them with any of my weight, though! Then a bit farther and we were able to glimpse the glaciers we would be passing later. And then, happily, Stella Point. I had wanted to eat chocolate to honor Stella, but instead had a couple of bites of RxBar and then we headed on. I was really dragging at this point, but Hamisi knew I was determined and kept whispering to me that I was "strong like simba". In this stretch we passed the main group of day climbers, hurrying down. Tony(Jess) said that at the summit it felt like the ground dropped out from under him, so he was going as fast as he could. Sometime after Stella we passed an open stretch exposed to the Emerald Glacier which was FREEZING COLD. I had to stop and breathe, despite Wil begging me to keep moving because it was so cold. Apparently Hamisi had Wil's phone for a while. Who knew? Then, finally, we could see the summit sign on a hill in the distance. It was enough to make me weepy. I didn't stop to take a picture, but I'm glad Wil did. Here we met Todd and Maureen, heading down from their summit. Maureen was her usual positive self, and told us we were in good hands. We were the last folks going up. By this point Hamisi was quietly singing the "Kilimanjaro" song to me to keep me moving. One of our fellow climbers, Maureen, who was at the summit half an hour or so before us, took this gorgeous panorama. I confess that the summit was something of a non-event, and that it was entirely my fault. It is to my eternal shame that, after hugging and kissing and taking some photos, I just turned around and slowly started heading down. I was so cold I put on my big down "Puff Daddy" jacket, offered my smaller down jacket to Hamisi to layer with his gore-tex parka, and set off while Wil and Hamisi were still getting themselves organized. Apparently I said, "We're not off the mountain yet. We're losing daylight." Luckily -- or by design? -- Hamisi had dragged the tip of one of my poles on the way up, so I knew exactly which way to go down. We were naughty and took the closed route rather than the detour to get back to Stella Point. This offered us one last look into the crater, and I caught this shot of the sun setting behind the rim. We also discovered that our camelbak tubes had frozen, so we had no water. Must have been the wind coming across the glaciers. So now it was something of a race. We at least wanted to get below the Jamaican Rocks before dark, so we hustled as fast as we could. The moon was half full, giving us just enough light in the twilight to make it through. Another guide -- Felix -- arrived to help get us down. He took my hand and we started scree-skiing, something of a controlled fall down the mountain. Amusingly, I had been looking forward to this part of the descent. But in the dark I didn't like it because I couldn't see where I was going. Wil, on the other hand, hadn't wanted to, but liked the freedom of not really being able to see, but just going downhill quickly. Still, I held Felix's hand and went as fast as I could. Then when we reached the "road" -- the more packed trail -- two summit porters arrived, put my arms around their shoulders, and ran me down the last mile or so in the dark. I was met by Erik, who gently guided me into the dining tent -- just Jenny and Mark and Laurie were in there. I begged for some water -- it had been well over an hour since I'd had any -- and Erik gave me his bottle of warm water to drink from. It was only then that I realized that Wil wasn't there and I didn't know where he was. I tried to get up but Erik said he would go out and find out where Wil was. I was so relieved when Erik said he was only 5 minutes out of camp. The chef brought us some soup, which I managed to eat a little of, while Jenny and Erik took turns telling me how brave I was. Then Wil arrived -- cue crying, hugging, and relief. The chef then brought us a massive platter of spaghetti with bean sauce. Bless their hearts, making vegetarian food just for us -- but all I could manage was a forkful of noodles and a spoonful of beans. I had a really wheezy chest and I couldn't stop hyperventilating. We headed to our tent, me on the arm of one of the waiters. Someone told me later that they were escorted to their tent by waiters, and when they got there the waiters took off their boots for them. So sweet. My breathing was so bad that when we lay down in the tent, Wil actually got up and got Yesse to make sure I was okay. We just didn't know what HAPE actually sounded/felt like. But my oxygen levels were good, so it was probably just exhaustion. That and the kilo of volcanic ash I had breathed into my lungs going up and down Kibo! But it really did sound like a cat ... or some sort of rattle ... was in the tent with us. I shivered for a while -- I couldn't bring myself to take off my climbing clothes, which I know was stupid, but I couldn't think of what to put on to sleep in. But I fell asleep. I got up in the night after the midnight crew had left, and had to go to 4 toilet tents before I could find one that wasn't full. Heck, the porters had lots of other things they needed to do that night! I half wanted to stop and admire the stars, or the line of headlamps going up to Gilmans -- but I really just wanted to get back in the tent and try to warm up again.